The steel River Hull Footbridge could be the world’s first footbridge that rotates to open or close for river traffic while pedestrians are still on it. The beautiful prefab structure designed by London-based McDowell + Benedetti spans the River Hull in Yorkshire and takes about two minutes to fully open or close. It will connect the city center with the eastern development, acting as both an important infrastructural urban element and a new civic landmark. 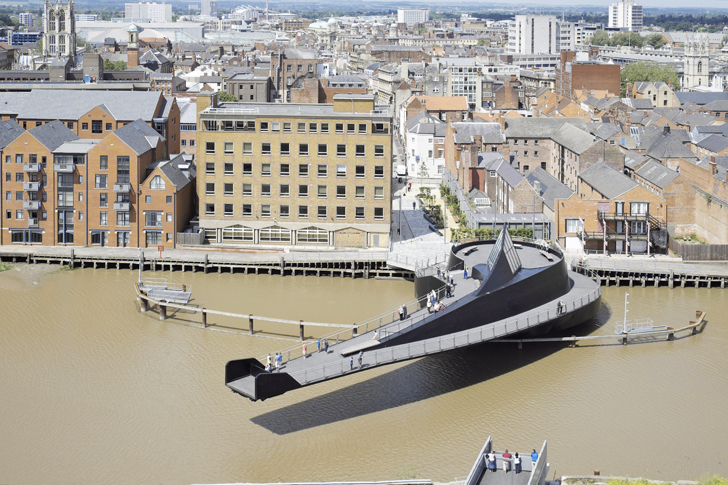 The footbridge is approximately 16 meters in diameter and features a series of wheels running on a circular track below the hub that allows it to open and close – depending on the amount of river traffic. A full sequence takes about two minutes and moves very slowly at a speed lower than that of the London Eye. Pedestrians and bikers can stay on it while it rotates and experience the river from a whole new perspective. The lighting for the bridge was designed by Sutton Vane Associates, who made sure that the energy efficient lights cast a trace over the water at night and create an appearance of the bridge being defined by the point of light from the line of fittings. Small points of light emphasize the shape of the bridge and appear when the bridge starts to pivot. To add to the drama, a row of recessed lights turn on while the bridge is moving, creating a unique light show. The west bank of the bridge is also undergoing a transformation. It has been re-landscaped by Grontmij, which has replaced a large car park along Scale Lane Staith with a series of informal “garden rooms.” New layers of vegetation are planned to create a natural screen towards the adjacent building and orient pedestrians to the main visitor attraction in the area – The Deep, which is one of the most spectacular aquariums in the world. The footbridge is approximately 16 meters in diameter. It features a series of wheels running on a circular track below the hub that allow it to open and close, depending on the amount of river traffic. A full sequence takes about two minutes and is executed very slowly. 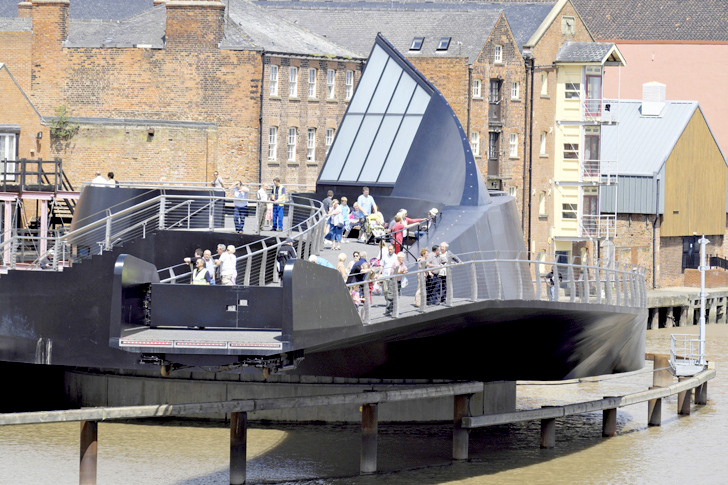 Pedestrians and bikers can stay on it while it rotates and experience the river from a whole new perspective. Small points of light emphasize the shape of the bridge and appear when the bridge starts to pivot. To add to the drama, a row of recessed lights turn on while the bridge is moving to create a unique light show.